Canada is even more a suburban nation than generally thought, according to new research that digs deeper than the usual core city versus suburbs distinctions. Researchers at Queen's University in Kingston, Ontario have announced groundbreaking research that disaggregates 33 census metropolitan areas into four classifications: (1) urban core, (2) transit oriented suburban, (3) automobile oriented suburban and (4) exurban lifestyles, which are also automobile oriented. The findings were made available to canada.com and will be published during the autumn in an academic journal. Professor David Gordon, director of the School of Urban and Regional Planning at Queen’s University summarized the research as indicating that “Canada is a suburban nation.” This may be surprising, the core cities of Canada represent a larger share of their metropolitan area population than is common in the United States. However, the core city versus suburban (outside the core city) classification substantially understates the suburban and automobile oriented nature of Canada’s metropolitan areas. This definition has long since become obsolete with the substantial annexations of suburban areas by Calgary and Edmonton and the forced consolidations of Toronto, Montréal (parts of which were reversed) and Ottawa. Even the core city of Vancouver, which has had essentially the same boundaries for at least 60 years, contains considerable expanses of suburbanization beyond its urban core. The core city of Toronto contains large areas of suburban development, such as in Scarborough, North York and Etobikote. The same is true of the core cities of Calgary, Edmonton and Ottawa and the ville de Montréal. To get around this difficulty, we used federal electoral district data to do an early analysis of urban core versus suburban growth when the 2011 census data was released. Our findings were that the greatest share of growth had been in suburban areas (See: Special Report: Census 2011: Urban Dispersion in Canada). The Queens University researchers went considerably deeper, and showed that 95 percent of metropolitan area growth had been in suburban areas between 2006 and 2011, a somewhat higher figure than the 93 percent suburban growth derived from the federal electoral district data (federal electoral districts are smaller than the large core cities). Gordon and the research team divided metropolitan areas into the four classifications at the census tract level. The census tract level is ideal for this type of analysis, because it is the closest approximation to the neighborhood. The Gordon et al analysis is thus finely grained, and may be virtually unprecedented in the world. The research uses criteria developed from journey to work mode data (such as transit, walking, cycling and automobile) and residential densities. Gordon et al called their urban core classification "active core," to note the greater dependence of residents on walking and cycling for commuting to work. They divided suburban areas into transit and auto suburban areas, and designated the rural areas of metropolitan areas as exurban (Note). The findings may be surprising to those retro-urbanists who hold Canada up as a planning model. When urbanization is examined at the neighborhood level, little of the metropolitan population actually follows the urban core model. Overall, the average urban core constitutes approximately 12% of the metropolitan area. This varies little by population category. In describing the results, Gordon noted that there is a tendency to “overestimate the importance of the highly visible downtown cores and underestimate the vast growth happening in the suburban edges.” This is especially evident in the largest metropolitan areas. Among the six major metropolitan areas (those with more than 1 million population), the urban cores also average 12 percent of the population (Figure). In relative terms, Vancouver has the largest urban core, at 16% of its population, followed by Calgary with 13% of its population. Toronto, Montréal and Edmonton all have urban cores with approximately 11% of their population, while Ottawa, which is both in Ontario and Quebec, stands at 12%. This means that the major metropolitan areas are, on average, 88% suburban or exurban. There is also relative consistency with respect to the populations of the transit oriented suburban areas. The largest are in Toronto and Montréal, at 14%. Vancouver and Edmonton have 12% of their populations in transit oriented suburban areas and Ottawa 11%. 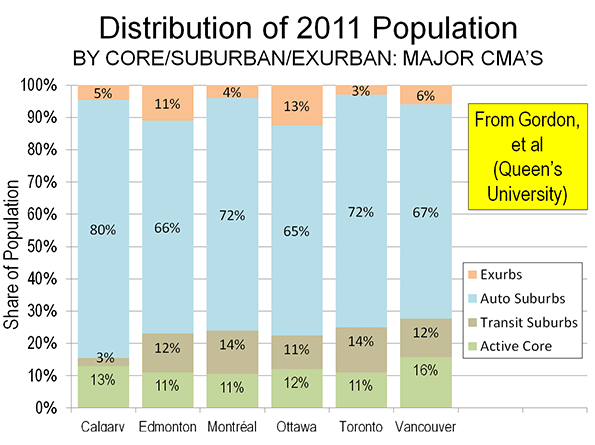 However, transit's reach is much less in Calgary, where the transit suburbs have only 3% of the population. Calgary was the most automobile oriented of the major metropolitan areas, with 85 percent of residents living in automobile suburbs and exurbs. But other major metropolitan areas were not far behind, ranging from 73 percent in Vancouver to 78 percent in Ottawa, with Toronto Montréal and Edmonton in between. Generally, the level of suburbanization was similar even in the smaller metropolitan areas. Interestingly, Gordon’s method did not require an urban core. This is illustrated by the Abbotsford (BC), where there no urban core is reported. Abbotsford is located in the Fraser River Valley, east of the Vancouver metropolitan area. Abbotsford developed in recent decades and, as a result, is so automobile oriented that the Queen’s University researchers do not even find a transit oriented suburb. Further, there were two instances of transit suburban areas being oriented toward urban cores outside their own metropolitan areas. In Oshawa, to the east of Toronto, a transit suburban area is west of Oshawa’s core, along the GO Transit commuter rail line to Toronto’s Union Station. Similarly, in Hamilton, a transit suburban area is located east of Hamilton’s core, on the GO Transit commuter rail line to Toronto. The media site canada.com has also published A Country of Suburbs with detailed census tract level maps for each of the metropolitan areas. There are also articles on each of the major metropolitan areas. Professor Gordon and his associates have pioneered a new, far more detailed method of analyzing the lifestyle components of the modern metropolitan area. They deserve credit for their objectiveness and attention to detail. Similar analysis is needed in other high income world nations. Note: Metropolitan areas always include rural areas – areas that are not urban. This is because metropolitan areas are employment market areas and people invariably commute from outside the population center (formerly called the urban area by Statistics Canada). The rural areas of metropolitan areas are far larger in geography than population centers or urban areas. This has been adapted from an article published at Frontier Centre for Public Policy Notes. Submitted by LifeAfterDeath on Wed, 05/27/2015 - 22:19. Submitted by wharlinda on Thu, 05/14/2015 - 21:58. Submitted by wharlinda on Sat, 03/14/2015 - 05:33.
great picture. I love this!! Submitted by jameswray on Wed, 07/09/2014 - 04:38. Submitted by joyce pearson on Thu, 06/19/2014 - 00:03. As per the above documentary,development of any sector not depends on the area or location like remote, suburban or urban but it depends totally on the living style of people whether they are adopting the current changes within them. And here in Canada the development and growth of automobile depends on the people and the living style. So as per the growth rate automobile sector is playing an important role for the people and for the development of automobile people demand also plays the same role. So as many research development of automobile sector will en light the growth of people. Submitted by saraflores157 on Fri, 05/30/2014 - 04:17. 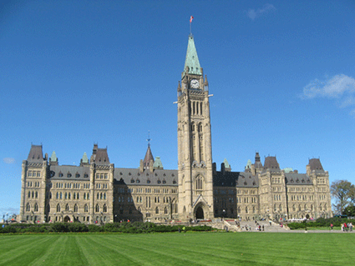 Canada is famous for its architecture as well as the most important visit places that people likes to visit in a huge number. It has some important places like the metropolitan areas and some other very attractive places that defining the place in a proper way. When someone visit such places people used to hire the service from the transportation service providers to get a proper and well maintained car to visit the places in Canada. According to me whenever you are hiring any German car better to check all the German Auto Parts properly so that you will not face any problem while traveling. Submitted by josephmartin on Wed, 05/28/2014 - 06:32. Automobile is now days rapidly increases around the whole world. It is one of the most essential parts of our day today life; therefore we have found different automobile orientated countries in which automobile concept is rapidly increases. Apart from other Canada is also one of the well known automobile oriented countries; which are highly developed for automobile and transportation. Submitted by carltonryder on Sat, 03/01/2014 - 00:29. Around the whole world we have found various automobile oriented nations. Where the demand and use of auto vehicles are increases at regular intervals; especially in Canada we have found the use of vehicles is almost double in comparison to other neighbor country. Automobile is the best way to develop our transportation system and in this modern age people were used to prefer various types of vehicle models with advanced features; that help to improve their way of communications. Submitted by shanebennett on Sat, 02/22/2014 - 09:22. In various urban regions we have found that automobile is partly developed; automobile is one of the most essential things and used in several nations. Especially in urban regions we have found that; the use of auto vehicles are rapidly increases and therefore people were effectively moving from one place to others. And report says that especially in Canada and other relevant nations we have found the use of automobile frequently and the whole population are depend upon the use of automobile.